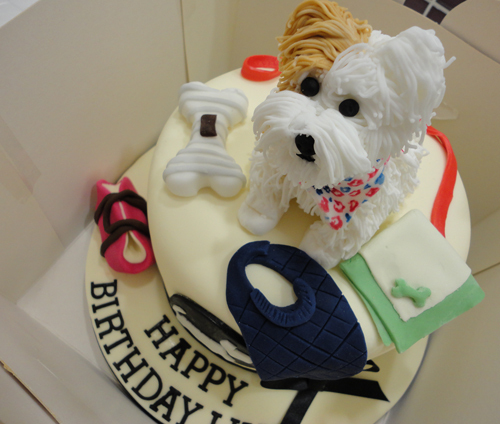 This has to be the best dog cake we have ever laid eyes upon. Lilly is LoveMyDog’s creative director. It was her birthday today and she got a fantastic surprise present from Carrie-Anne’s Cakes delivered to the studio. The cake Carrie-Anne created was such a piece of art that we nearly didn’t want to to cut into it, but it tasted just as good as it looked. Admittedly, the cake was for humans rather than dogs, but it’s been brilliantly decorated with items from our canine couture collections.